With the address of the first pit entered into the GPS, we left Williamsport Pennsylvania, an absolutely dreadful cup of coffee from the hotel clutched in my hand. It was so bad I almost spit it out but that would mean stopping and that wasn’t an option quite yet. The route led us through some amazing scenery and when I saw a sign that said there was a wilderness area close by, I decided to veer off course so the dogs could go for a walk. I sometimes forget that miles and kilometres are different units of measurements, and what I thought was a quick hop off the highway was not. On the plus side, we found ourselves winding through some stunning farm land before we came to the wilderness area. Even though it was a short walk, the dogs still managed to find a stream and go for a swim. At least it was shallow so I wouldn’t have to worry about a car full of soaked dogs. We were back in the car and I had found my way back to the highway, merrily singing along with the radio when I felt something on the back of my leg. Thinking it was a hair or thread, I reached down and looked to see that I was holding a tick. And now dear reader I have a confession to make: I HATE TICKS!!! You would think that growing up on farms in the country I would get over it. And the fact that my grandparents used to live in a tick-infested part of Manitoba and every night when we were visiting, we would do tick checks on people and dogs. I was actually proud of myself for not freaking out as I rolled the window down and tossed that little sucker out. Fortunately we soon needed gas and after filling the tank, I went over the dogs one by one. They must have thought they were getting a massage. Piper? Good. Jack? No problem. Leo? He must have gone through a nest because he had three on his ears. They had not been attached long and I had started them on Bravecto before we left which is supposed to kill those little bloodsuckers. Needless to say, I spent a lot of time checking myself in the washroom before moving on. Then, finally, we rolled into Ayden, North Carolina and laid eyes upon our first pit stop: Skylight Inn BBQ. A covered set of picnic tables beckoned to me. But first, the Q! Done. 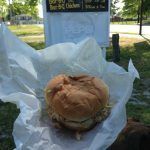 With a tray in hand I walked out to the car, unloaded the dogs, and sat in the shade at the picnic tables in the lot as I contemplated the food before me. A good helping of barbecue pork, coleslaw, and corn bread. The corn bread was dense, moist, and chewy; coleslaw a mass of finely chopped vegetation. And the pork…ah the pork. My first taste of North Carolina barbecue. It wasn’t the heavily smoked and sauced meat that I was used to. There was a definite acidity but above all else you taste meat then smoke and sauce. Back home you taste SMOKE with some meaty flavour. We devoured every little bit. Of course we; it would be downright cruel to not give them little morsels. Shhhhhh don’t tell my vet. 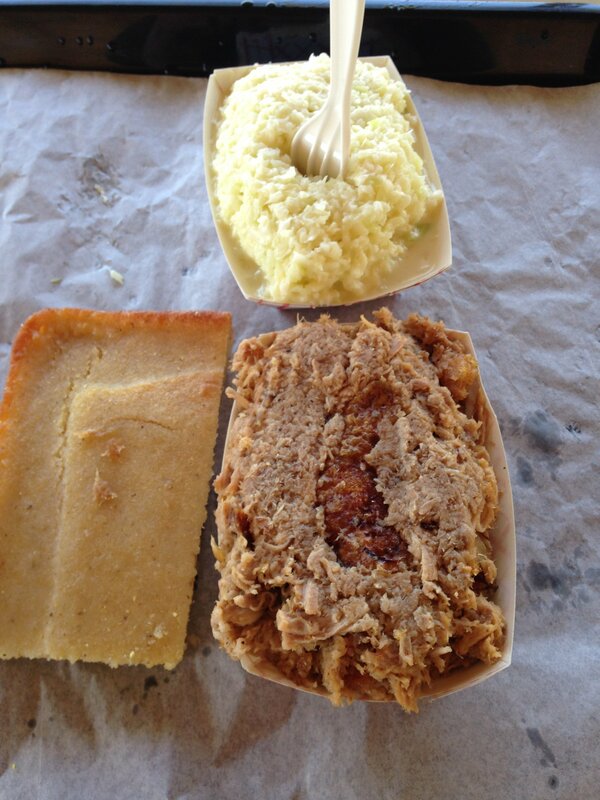 The plate from Skylight Inn Barbecue: pork, coleslaw, and corn bread. After packing the car up, I popped back inside to tell them how much I enjoyed the food. I absent-mindedly scratched at the back of my calf and found ANOTHER TICK! I had to contain the urge to let loose a yelp. I talked funny as it was; the last thing I needed was for the locals to think that I was having a meltdown. I punched in the next pit and when the map popped up I saw that it was…closed? Mid afternoon and it was closed. Huh. OK then pit number three. I didn’t really pay attention to where I was going, merely typing out the name of the restaurant and letting my phone order me around so when we drove into the real-life Farmville, I couldn’t help laughing. And then we rolled up to Jack Cobb & Son Barbecue Place. The exterior has one of the most colourful paint jobs I saw on the trip and for some reason it just made me happy. I went inside and after my introduction, the gentleman suggested the turkey. I was intrigued. So I had the turkey sandwich and hushpuppies. 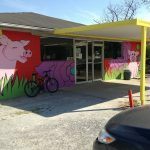 And here is where Southern hospitality starts to assert itself: we were talking about the barbecue trail and the long drive down and as the gentleman behind the counter hands me my food, he says “I pray that you enjoy.” For some reason that really stuck with me. I sat outside and took a bite of North Carolina barbecue turkey. It was a tad bit dry but with a shot of sauce it was divine. Again the smoke was a subtle complement instead of the dominant flavour. Now for the hushpuppies. They make me think of deep fried bits of corn bread. As I ate, I watched the steady stream of vehicles pull into the lot and leave with bags of food. I stopped in to thank them for the food then entered the next pit. Beauty. Turkey sandwich from Jack Cobb & Son. Hey you gonna eat that? As I was driving along the road, I saw a sign for The Apple Jack Factory. I continued on but after a very short distance I had to turn around. How could I pass by a place that sells homemade fried pies and coffee? I mean it was almost 5:00 pm so no coffee but pies? I had to check it out. I am an avid baker and I am always looking for ideas of course. The Apple Jack Factory was a small trailer on the side of the road but it was loaded with all kinds of baked goods. I finally settled on something called “chew bread”, a pecan tart, and a coconut tart. There was a large field next to the trailer so we had a little walk before continuing on our way. 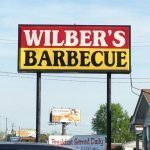 Next stop: Wilber’s Barbecue in Goldsboro. 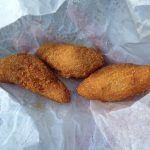 By this time, my belly was pretty full so I decided to skip the full plate and just have the sandwich…and hushpuppies. I also picked up a few bottles of sauce to take back for friends. I was standing there chatting with some of the locals and staff and they all seemed blown away that I would drive so far just for the food. As I stepped up to the register to pay, one woman waved me aside and said that she would pay and then totally brushed off my protests. She looked at me and said “You’re getting Southern hospitality.” And then she left. 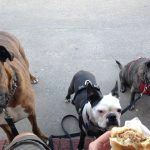 I was stunned and felt so humbled as I sat outside with the dogs. 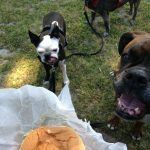 The sandwich was the best one I had eaten that day and the hushpuppies…they didn’t last long. Seymour Johnson Air Force Base is nearby so I had the opportunity to watch the planes fly overhead as we ate. A beacon for a hungry traveller. 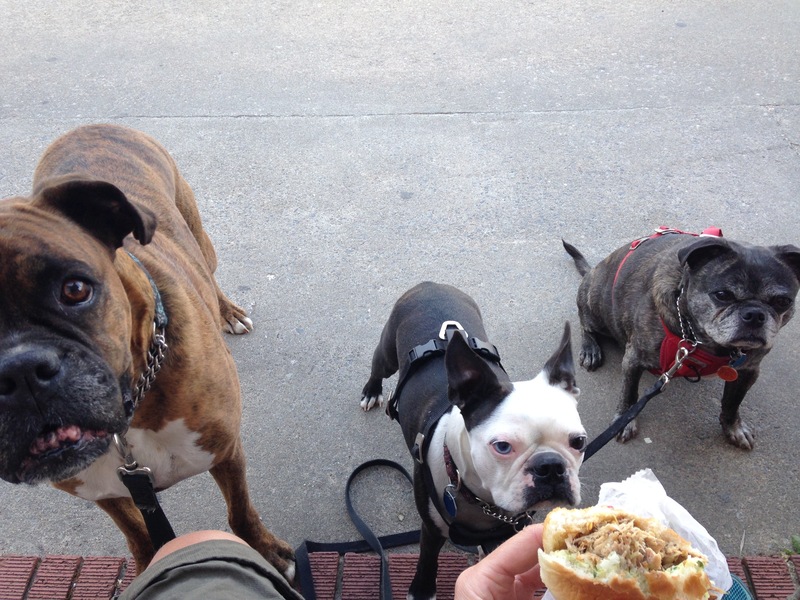 Waiting their turn for barbecue sandwich.. I went back inside to tell them how much I enjoyed the food and to ask if they knew of any places nearby to camp. No one really knew any camping spots but there were some hotels in the area. As several people were trying to figure out how to give the Canadian directions, I had another sandwich thrust into my hands. It was made accidentally and so I had to take it; or that was the story anyway. With directions in mind and a sandwich in hand, I went to the car. As I was driving, I saw a sign for camping. The weather was nice so I figured we would enjoy some outdoor time. We drove into Busco Beach just as it was closing. Fortunately I was able to get a spot which wasn’t hard as I was the only person camping. It is geared more for ATV’s so the camping leaves much to be desired. Just wide open spaces to pitch a tent, the dust is incredibly fine so it got everywhere, and the ground was packed so hard I couldn’t get pegs in. It still wasn’t the worst place I’ve ever camped. There are some trails so we spent well over an hour exploring as planes flew overhead. It was well into twilight by the time we went back to our site. 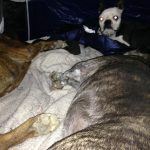 The first camp-out of the year and the dogs were stretched out on their blankets before I had finished zipping up the door. 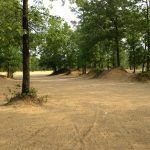 One of the tent areas at Busco Beach. 1 response to "The Road to Q-Demption – Day 2"